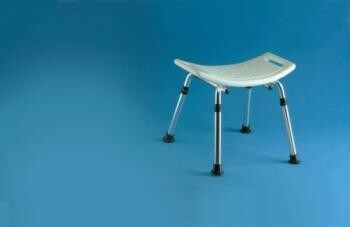 This shower stool has a shaped seat that is designed to fit the body more comfortably. The raised edges of the seat have gripping handles to give the user extra confidence and stability. For additional support the seat is available with a curved backrest. This shower stool has a shaped seat that is designed to fit the body more comfortably. The raised edges of the seat have gripping handles to give the user extra confidence and stability. For additional support the seat is available with a curved backrest. With an aluminium frame and moulded plastic seat, perforated for drainage, this stool is both lightweight and corrosion resistant. The seat height is adjustable between 406 and 508mm (16 and 20").Maximum User Weight: 281/2 Stone (182kg). Seat dimensions 510 x 320mm (20 x 121/2").